The Trade Association of Information Technology (TAIT) has recently hosted a panel discussion as part of their ‘Market Adda’ initiative. The event brought together industry veterans from across the IT Ecosystem, to discuss and share insights on how IT retailers and traders can survive the competitive online marketplace and evolve their business. Held at the Avion Hotel, Vile Parle, the event was a major success, with members passionately participating in Q&A’s and engaging with speakers post the event. 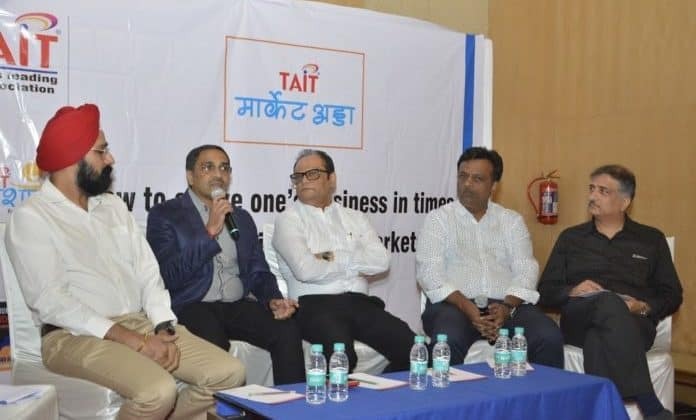 With leading e-commerce marketplaces like Amazon and Flipkart announcing mega sale ahead of the festive season, the panel discussion was hosted by TAIT at a strategic time. With the competitive online marketplaces offering huge discounts, fear of losing the business and most of all, becoming eventually irrelevant, were some of the genuine questions that the ‘Market Adda’ addressed through the panel discussion. The gathering ended by a LaunchPad Pro Session by Nikesh Jain, Director, NeoSoft – a premier trading enterprise for computer peripherals and accessories. Highlighting his 17 years long association with the IT trade industry, Nikesh shared his heartfelt gratitude to all members and went ahead to showcase the latest range of Cabinets, mouse, keyboards and other peripherals and Computer speakers. His aesthetic and reasonably priced products were well received and appreciated. TAIT hosts ‘Market Adda’ – A panel discussion on surviving in the competitive online market 0 out of 5 based on 0 ratings. 0 user reviews.